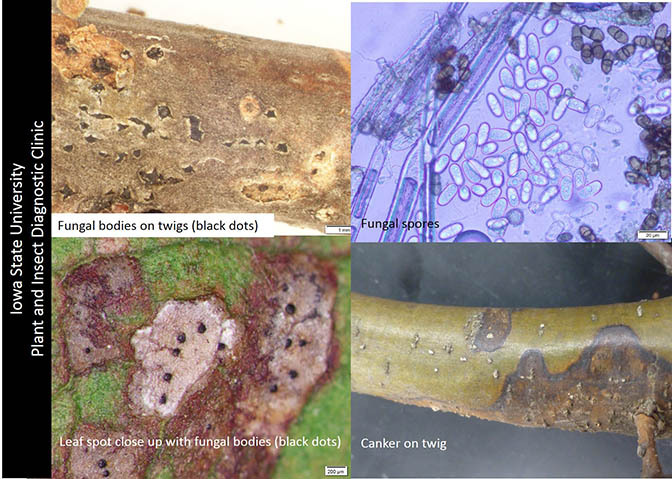 Botryosphaeria fungus can cause blister-like structures under the bark of twigs, bark sloughing, cankers, leaf drop, diebacks and fruit rots on tree fruits. Many species of the fungal organism Botryosphaeria were found on most of the woody plant samples we received in the Plant & Insect Diagnostic Clinic this year. These fungi belong to a family of pathogens (capable of causing disease) and endophytes (present in the tissue but dormant) capable of living and causing disease in woody tissues such twig, branches, and fruits. These fungal pathogens infect about 200 different hosts including broadleaf trees, woody ornamentals and conifers. Symptoms vary by host plant but can include blister-like structures under the bark of twigs, bark sloughing, cankers, leaf drop, diebacks and fruit rots on tree fruits. These fungal pathogens have the ability to colonize and live in plant tissues while causing disease only after the onset of environmental stress. Severe infection can follow drought, wounds, or freezing damage, and may occur on non-native plants or plant outside of their recommended range or USDA zone. What can you do to prevent this disease from affecting your plants? Plant the right plant in the right zone. Properly install (plant) and care for new plants, especially during the first year. Promote tree vigor by proper mulching and irrigation during dry periods. In most cases, fertilizer is not needed. See "Community Tree Planting and Care Guide" (HORT 3054). What can you do after your plant was diagnosed with Botryosphaeria? Prune in the winter when trees and shrubs are dormant and during dry weather. Pruning removes the source of some of the fungus and helps to prevent the spread. It also increases airflow through the shrubs making it more difficult for the fungus to infect new tissue. These pathogen can be moved by pruning tools! Disinfect pruning tools between cuts to avoid spreading the pathogen to healthy branches or other plants. Links to this article are strongly encouraged, and this article may be republished without further permission if published as written and if credit is given to the author, Horticulture and Home Pest News, and Iowa State University Extension and Outreach. If this article is to be used in any other manner, permission from the author is required. This article was originally published on November 11, 2016. The information contained within may not be the most current and accurate depending on when it is accessed. Do I need to plant more than one cherry tree for pollination and fruit set?